At the same time I was heartened, knowing we play a critical role in connecting our clients with needed care. A volunteer called saying one of their people was extremely short of breath and was having difficulty speaking. Their “person” is a young 95 year old, legally blind, lives alone, doctors infrequently and has no family. Along with a formal Power of Attorney for finances, we are their only connection to the “outside world”. Six days a week we bring not just a meal, but also a conversation with a smile in our voices to this individual. I called the client to check in and see how they were doing; not so good. They could barely talk – needing to take a breath after every 1-3 words. They were confused – when they’re usually very alert. Their breathing remained shallow and labored. I could hear the anxiety in their voice and change in timbre. I could see their confusion in making a relatively simple decision – part of their mind knowing they should get help, but also uncertain if they “really” needed medical care. I gently asked what they wanted to do to get help with their breathing. They replied “Well, I guess I should go see a doctor.” I quietly told them I was concerned about their difficulty breathing and that I thought it would be a good idea for the EMTs to come and help them get medical attention. They agreed. “More than a meal” could almost be our tagline. Our volunteers let us know when things aren’t “normal” with their people and we follow-up with those concerns. Small, handmade cards, placemats and other crafts from area school-aged children bring a bit of joy to someone who might be feeling a bit “blue”. Volunteers encounter situations where their quick response ends up saving lives. A birthday card and individual piece of cake (or sugar free candy) is sometimes the only recognition a client receives – not because of cultural or religious preferences, but because they have no one left. It’s a brief visit, but we break down the walls of social isolation. As I finish writing this, I’m saddened as I imagine what it must be like to grow old and to have out-lived family and friends; to be visually impaired to where I can’t even see the buttons on the phone; and to become so confused, when I’m normally very alert, I can’t make decisions for myself. But there is a silver lining: I know that because of Meals on Wheels, because of the care and concern our volunteers have for “their people”, this person received medical attention they might not otherwise have received. Medical attention that sometimes saves a life. It seems that we always get more referrals this time of year – the weeks between Thanksgiving and the New Year. We attribute it to younger family members seeing their aging parents or grandparents, and realizing their loved one could benefit from home delivered meals. 1. Are your aging parents taking care of themselves. We, including our volunteers, pay attention to our clients’ appearance – has there been a change in how they’re caring for themselves and their home? Is there heat? Is the yard overgrown? Are they able to clear snow/ice from their driveway and stairs to the house? 2. Are your aging parents experiencing memory loss? We all occasionally forget things. But there’s a difference between normal memory loss and that associated with types of dementia. Misplaced keys, glasses, and other items are “normal’. Getting lost in familiar neighborhoods is more concerning. 3. Are your aging parents safe in their home? 4. Are your aging parents safe on the road? 5. Have your aging parents lost weight? Weight loss can be attributed to difficulty cooking, loss of taste/smell or underlying health conditions such as depression, malnutrition, or cancer. 6. Are your aging parents in good spirits? What is their mood like? Have there been any changes? Depression and anxiety are not part of normal aging; they can be treated at any age. 7. Are your aging parents able to get around? Are they unsteady on their feet? Is it difficult for them to use stairs? Have they decreased their physical activity? 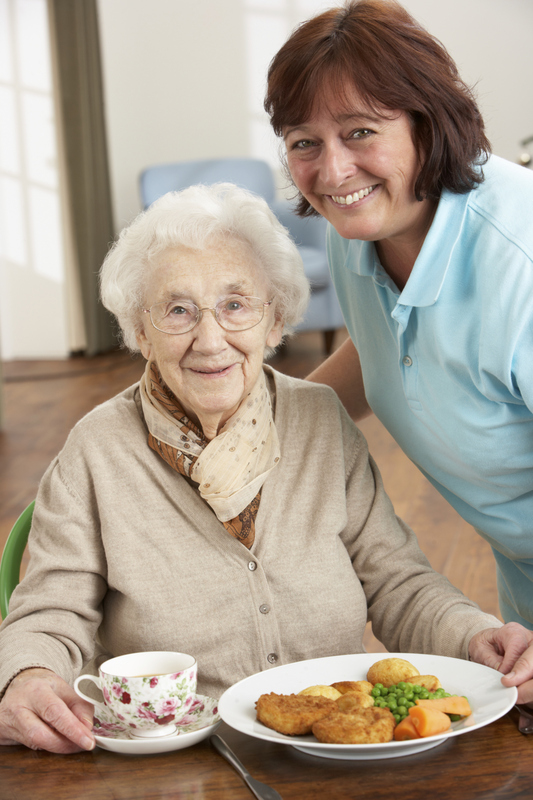 Programs like Ann Arbor Meals on Wheels can help if your loved one is having difficulty preparing meals due to physical and emotional health problems. The visit by the volunteer who delivers the meal also serves as a wellness or safety check. We contact you if there concerns and can make referrals for support services. 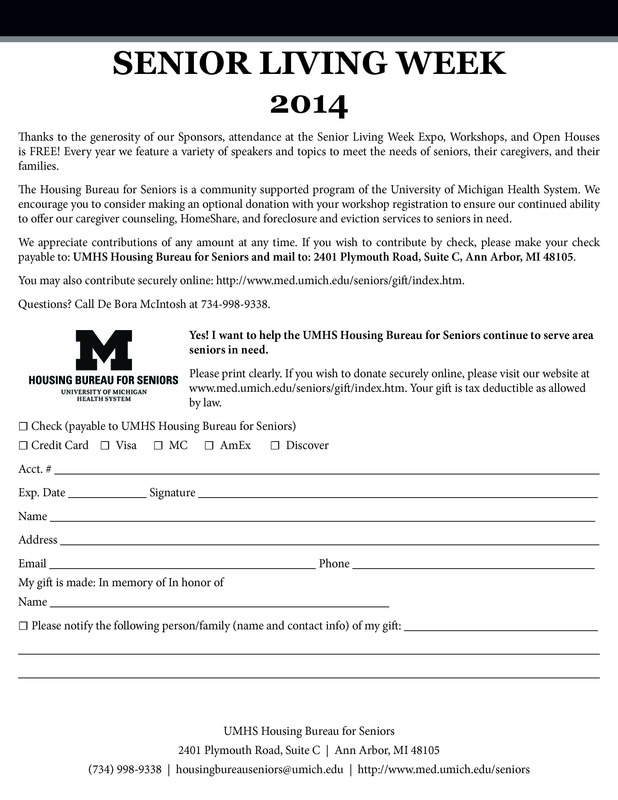 For more information about eligibility visit http://www.med.umich.edu/aamealsonwheels/mealmakereferal.html. Knowing what each medication is for and taking the right medicine at the right time. Health literacy challenges are greater for older adults than younger populations. They have more chronic illnesses and use health care services at higher rates. Limitations of physical and/or cognitive functioning add another layer of difficulty. Even mild vision and hearing loss can make it difficult to process information that is otherwise understandable. How health care providers present information, availability of culturally appropriate information, the environment in which it’s presented and are significant, contributing factors to health literacy. Write down your questions before your appointment. Record their responses. Write down new information from your doctor and their staff. Ask them to repeat and further explain if it is not clear to you. It’s okay to say you don’t understand something! Let your doctor and others know that you do not understand what they are telling you. Health care providers are often rushed and use a lot of medical terminology. Background noise can also make it difficult to process what is being said. Ask your doctor, nurse, pharmacist and others to use plain, non-medical words. Get a phone number for the nurse or clinic, so you can call with questions you think of after you have left or if you have forgotten something. Volunteer to go with a friend or loved one to their next medical appointment. Help them take notes and ask questions. Volunteers are the backbone of Ann Arbor Meals on Wheels. Not only do Volunteers deliver meals to the homebound in our community, they also provide companionship and a warm, friendly smile. Ann Arbor Meals on Wheels Volunteers may be the only person a client sees all day. The meals you deliver are the primary source of nutritious food for most of our clients. Summer is hard for the program because school is out and volunteers take vacations. Ann Arbor Meals on Wheels has also lost volunteers because of their advancing age and this will continue as our population ages. • Connect to your community. The simple act of offering your 1-2 hours of your time and compassion positively impacts the daily lives of those in need, as well as your own. • Engaging in service to others is an invaluable experience. • Be a force for social change and an inspiration to others. • At risk and elderly community members will eat because of you. Volunteers of all ages to deliver meals to the homebound in the Ann Arbor area. Drivers must be at least 18 years or older and able to use their personal vehicles to deliver meals. Persons under 18 can volunteer if accompanied by an adult. 2) the frequency – weekly, biweekly, or monthly. We deliver meals 6 days a week. Mon – Fri: Meal pick-up at 11:30am. Sat (Jan – Aug): Meal pick-up at 10:30am. Sat (Sept – Dec): Meal pick-up at 9:30am. Average delivery of meals takes 1 – 2 hours. Interested? Contact us! Please feel free to call (734) 998-6686 or send an email to aamealsonwheels@umich.edu. Where can you find a 100 year-old tennis champion, an 86 year-old pole vaulter, and a team of rough-and-tumble basketball grandmothers? On May 29, 2014, you can find them on the big screen at the Michigan Theater when the award-winning feature-length documentary Age of Champions is presented as part of a fundraiser to benefit local seniors. Age of Champions chronicles the triumphs and travails of athletes chasing gold at the National Senior Olympics. Described as “infectiously inspiring” by the Washington Post, this powerful film has inspired viewers across the country to be healthier, happier, and more active, and to understand that older adults are capable of incredible feats. It’s never too late to live life to its fullest! Producer Tad Ochwat will be at the event to introduce the film, share behind-the-scenes stories, and answer questions after the film. View the film trailer here. See you at the 2014 Senior Living Week Expo! 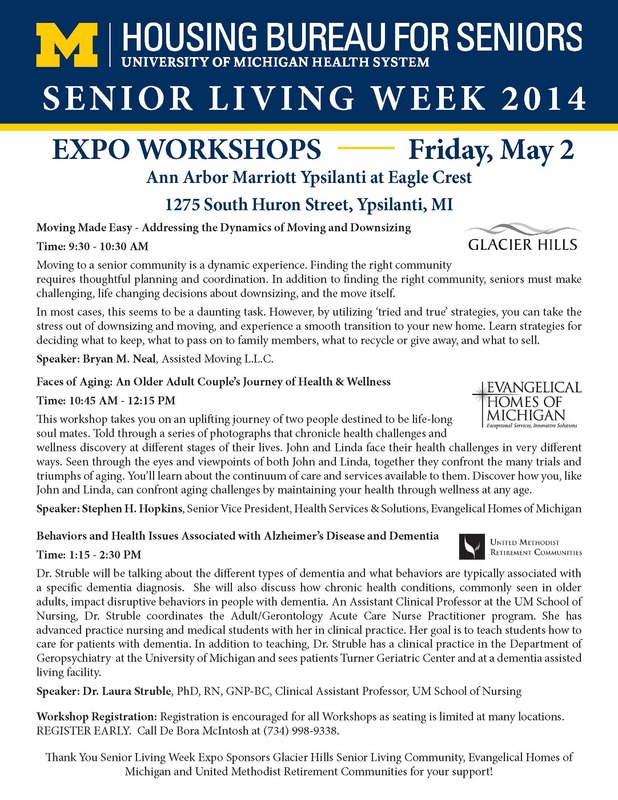 We are very excited for the 2014 Senior Living Week Expo on Friday, May 2nd at the Ann Arbor Marriott Ypsilanti at Eagle Crest (1275 S. Huron, Ypsilanti) and we hope you are too! Don’t forget to stop by our table and say hello – we’d love to meet you and tell you all about Ann Arbor Meals on Wheels! Below is a flyer of the workshops that will take place at the Expo, as well as a workshop registration form. If you have any questions about the Expo workshops or any of the workshops that will take place during Senior Living Week (May 2 – 10), please don’t hesitate to contact De Bora McIntosh at the Housing Bureau for Seniors at (734) 998-9338. Celebrate National Nutrition Month – Enjoy the Taste of Eating Right! Coming Soon – The Judy Fike Annual Golf Outing to benefit Ann Arbor Meals on Wheels! 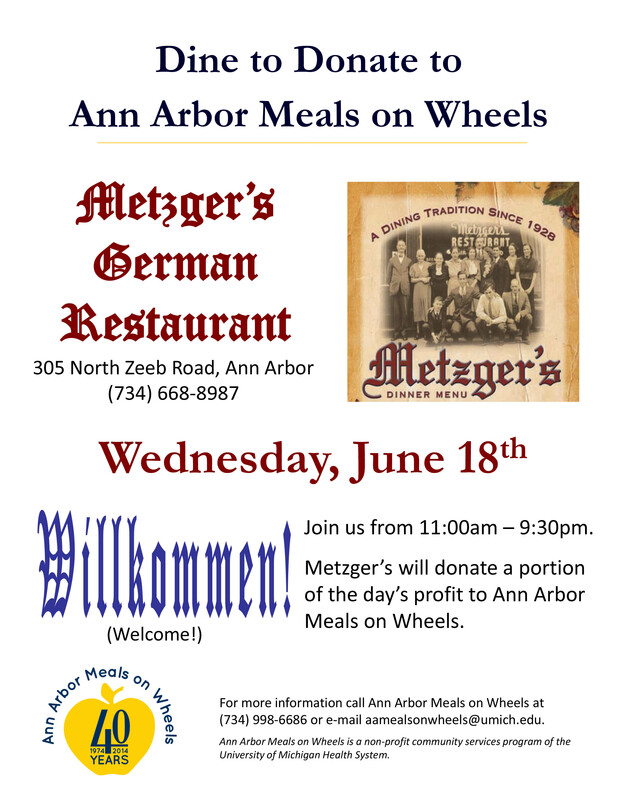 Join Us at Metzger’s and Support Ann Arbor Meals on Wheels! Tee It Up to Make a Difference!